Are you looking to SAVE THOUSANDS on your next home purchase? Well look no further, this home qualifies for a NO CLOSING COST LOAN. Here is your chance to own this Priced to sell & Move in ready home. Awaiting your arrival is this stylish 3-bed, 2-bath + 2 bonus rooms home located in highly sought after Hollowbrook Subdivision in Tuskawilla. This home is walking distance to some of the best schools districts in the area and very close to shopping, popular restaurants and more! 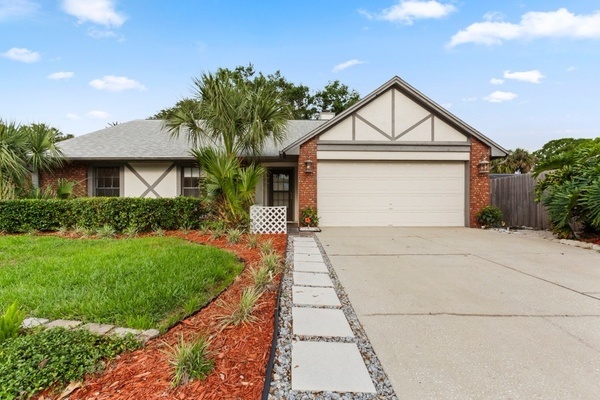 Upon entering you welcome Light and bright open floor plan with high Cathedral ceilings, a cozy marble fireplace, skylights and new wood-look tile floors throughout. The Designer kitchen includes brand new quartz wrap around counter tops with breakfast bar and stainless steel appliances. Large Master suite offers two walk in closets, double sink with custom remote controlled lighting throughout the house. Built in Hot Tub Spa in the bonus room with additional AC. This room can be used in many ways, home gym, media room or converted to a fourth bedroom. Irrigation meter, two zone sprinklers, Alarm system, New compressor on Upgraded 5-ton Heat Pump. Home is professionally wired for A/V, Cable, Satellite TV throughout. The Garage has been converted to a large home office and can easily be converted back to a garage. Plenty of storage in the Two outdoor storage facilities, private outdoor shower with patio and gazebo in your private fenced yard. Stand up attic along with secure locking mailbox. Schedule your private showing today!